An indoor scavenger hunt is a great idea when it’s cold outside. And I’m not talking about scavenging for Christmas presents or doing other shopping. Timed with the upcoming release of Star Wars: Episode VII – The Force Awakens, there’s a new scavenger hunt that will test your knowledge of Star Wars past. Brought to you by Watson Adventures, The Museum Strikes Back Scavenger Hunt will take place on December 5 and 12 for adults, with a family version on December 30 at the American Museum of Natural History. The way it works is that you’ll be asked questions that test your knowledge of the movies and you’ll have to relate the information to items that you’ll find in the museum. The clues that you decipher will lead you to objects on display where you’ll have to answer a question about the object. And so it continues. Without giving away too much, you’ll be wandering around the beasts in the Hall of Mammals, searching among bugs in the Hall of Biodiversity, visiting ferocious humans in the halls of African and Asian Peoples, and more. There’s pretty much something to find in every hall in the museum. Happy holidays and happy hunting! 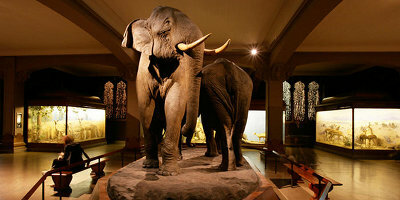 http://www.watsonadventures.com/public/event/museum-strikes-back-hunt-ny/. You can buy tickets online or call 877-9-GO-HUNT, extension 22. This entry was posted on Sunday, November 29th, 2015 at 12:56 pm	and is filed under Stuff to Do. You can follow any responses to this entry through the RSS 2.0 feed. You can leave a response, or trackback from your own site.